Nothing starts your vacation better than a delicious and spicy Bloody Mary no matter the time of day. Our cabin attendants will customize to your preferred spiciness. The best part of the whole thing: the spicy green bean! 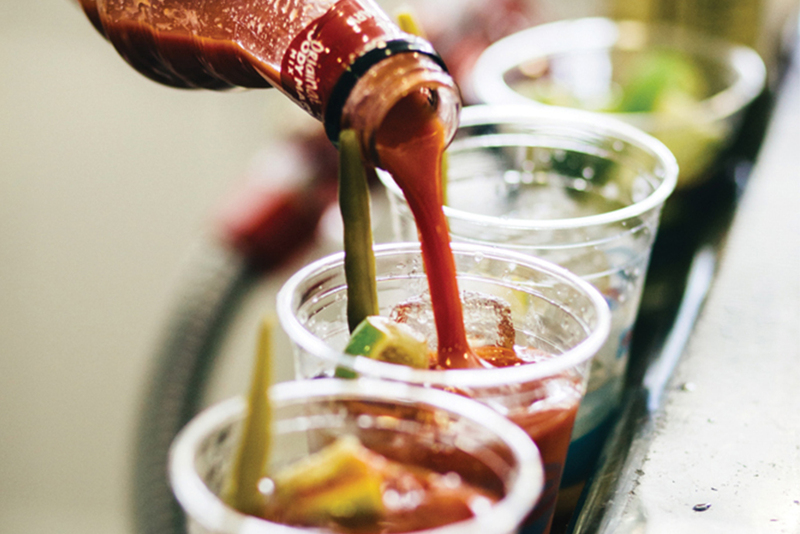 Its briny and crunchy taste takes this already amazing Bloody Mary to the next level. It’s a window to another world. A glass bottom boat is the perfect way to appreciate the diverse marine life and crystal-clear waters of Catalina Island. One of the first tours offered this old school attraction is fun for the whole family. Stop by one of Catalina Island’s most recognizable landmarks for a quick lunch. At the end of the pier, you’ll find Avalon Seafood, famous for their fish & chips and swordfish sandwiches. Dine al fresco some delicious seafood as you watch all the fun activities happening in Avalon Bay. Need to work off that big lunch or just love a good hike? There is nothing better than the Wrigley Memorial and Botanic Garden. The Botanic Garden is the primary gateway to access of the island’s most popular hikes, Garden to Sky Hike. Visit the Catalina Island Conservancy for hiking permit information. If a full hike is not your thing wander around the garden and walk up to the Wrigley Memorial. Constructed to honor the memory of William Wrigley Jr., the memorial is the centerpiece of the Botanic Garden with the commanding view of Avalon Bay and should not be missed. No trip to the island can be complete without trying Catalina’s signature drink, the Buffalo Milk. The sweet and creamy alcoholic concoction with hints of banana will give you that island feeling in no time. The drink was first developed on Two Harbors and is unique to the island. Many of the restaurants make the delicious drink, my favorites are Luau Larry’s and Bluewater Restaurant. If you would like to try the beverage with a bit a twist Descanso Fresh at the Descanso Beach Club has an ice cream version that contains the alcohol! Wherever you try this local treat, you will be sure to enjoy especially on a hot summer day. When you arrive to Avalon, you will notice a large round structure greeting visitors to Avalon. As one of the island’s most iconic landmarks, touring the Catalina Casino is on the bucket list for any visitor. On the tour, you will learn the rich history this iconic building dating back to 1929 or take in a movie at the gorgeous art deco theatre. The extraordinary architecture and murals will take your breath away. Try one or attempt the entire checklist to make your Catalina getaway extra special. One thing is for sure, a day is never enough time to explore the island. While planning your getaway, check out the amazing vacations packages to extend your time in paradise.